Extreme weather has the ability to leave us devastated, but with the easy-to-follow Extreme Weather Survival Manual you’ll be ready for anything Mother Nature throws at you. Dennis Mersereau and the editors of Outdoor Life magazine offer their life saving advice to help you survive blizzards, hurricanes, firestorms and much more. As a weather reporter, it’s only natural that Dennis Mersereau is a self-proclaimed weather freak. Slate.com said of him, “Don’t mess with the Mersereau. He will find your weather fables and he will crush them . . . We need more Dennises. In fact, the National Weather Service itself should be run by Dennis, with each local office headed by a Dennis-like weather blogger tasked with explaining the relevant weather news of the day, and entertaining us when the weather is boring.” Luckily for you, he’s partnered with the outdoor experts at Outdoor Life to bring you the foolproof guide to surviving extreme weather. From how to read the sky, to which of your grandma’s no-fail weather predicting tips actually work, to how to survive a Storm of the Century, this book has you covered. Filled with weird weather facts (what are those weird sounds under the snow and should you worry about them?) to hands-on survival hints (literally hands-on. 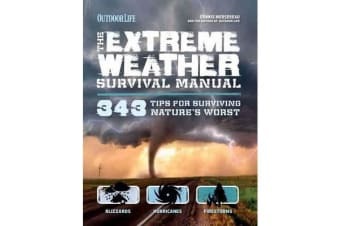 Like, don’t lose your fingers to frostbite) to true tales of amazing survival, the Extreme Weather Survival Manual is the one book you need to weather any storm. With high-quality design, intricate detail, and a durable flexicover—this manual is the perfect gift!